The end of the road may have arrived for former middleweight world title challenger Matthew Macklin – at least at top level – after he appeared to struggle last night in his first fight back down at 154 in 9 years, squaring off against former British title challenger, Jason Welborn. 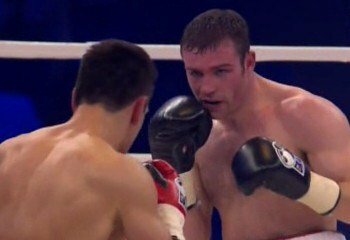 Macklin, now 33, was making noise about still wanting to win a world title, something he felt he could achieve by moving back down, although given last night’s showing in Birmingham, many are left wondering what is left for him at the top end of the sport. Clearly suffering the pace against the younger man, Macklin was given two rests for low-blows, the second of which looked perfectly legal, and he also spat out his gumshield towards the end of the fight, prompting many to speculate that making the weight hadn’t been as easy as he’d at first claimed. Looking to box for much of the fight as a counter-puncher, the more eye catching and aggressive work came from Welborn, while Macklin seemed content to tuck up and let the shots bounce off his gloves; although the scorecards at the end of the 10 rounder gave the home fighter the nod by margins of 96-94 (twice) and 97-93, leading many to feel Welborn was a little hard done by. “It wasn’t a great performance. I’ve been practising countering,” Macklin said post-fight. “When it worked, it’s brilliant, and when it doesn’t, it’s bad. It’s not going to work straight away. Sometimes I was there too long. Macklin also admitted he would be seeking to view the tapes and come to a decision about his future, adding he was going to remain realistic and would not be looking to ‘kid himself’ if the time has indeed arrived to pack it in. You are here: Home / Boxing News / End of the Title Road for Macklin?